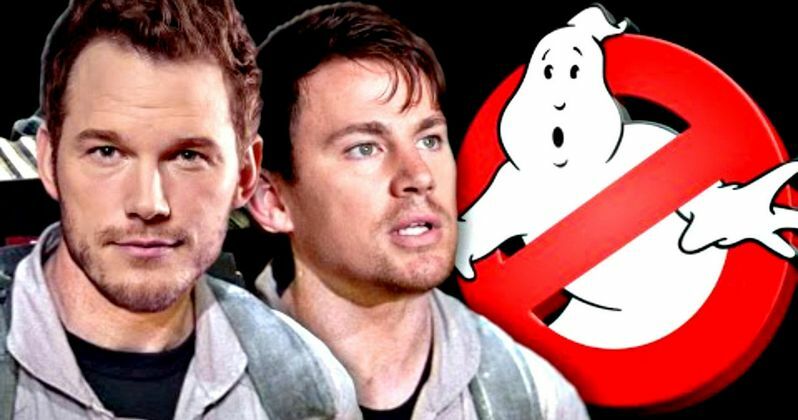 Channing Tatum Ghostbusters to Co-Star Chris Pratt? /ghostbusters-4-reboot-male-cast-channing-tatum/Yesterday, it was announced that Sony Pictures is planning a second new Ghostbusters that will basically be shot alongside director Paul Feig's all-female reboot starring Kristen Wiig and Melissa McCarthy. The movie was said to be all-male, with Channing Tatum producing and possibly starring and Captain America: Civil War directors Joe Russo and Anthony Russo at the helm. Well, according to Badass Digest, the initial report wasn't completely accurate. This will not be an 'all-male' adventure as previously reported, and it is part of an expanded universe that includes Paul Feig's female Ghostbusters and a possible prequel. And Guardians of the Galaxy star Chris Pratt will probably co-star with his longtime friend Channing Tatum. Sources at Sony tell Badass Digest that, while the movie won't be 'guy-centric', it will have males in two of the leading roles, and that the movie spun out of the chemistry between Channing Tatum and Chris Pratt in their real-life relationship. While Chris Pratt is currently a hot commodity after starring in Guardians of the Galaxy, with roles lined up in The Magnificent Seven, Cowboy Ninja Viking and Guardians of the Galaxy 2, this was not a case of getting the most popular actor to join a franchise. This is about two friends wanting to make a movie together. What is essentially Ghostbusters 4 will be a companion piece to the Paul Feig reboot, as Sony attempts to build a big shared universe. They want everything tied together so that it's not a bunch of franchises running in tandem. The hope is to have a third new Ghostbusters that brings Kristen Wiig, Melissa McCarthy, Leslie Jones and Kate McKinnon together with Channing Tatum and Chris Pratt, and it will be done Marvel's The Avengers-style. This is all planned out, and has been planned for quite some time. And it wasn't a change of heart by Sony to announce a male-centric Ghostbusters after many fans hated on Paul Feig's complete reboot idea. This will allow a lot of collaborators to work within this reboot of the Ghostbusters franchise. Badass Digest had read Paul Feig and Katie Dippold's, and while they were initially confused by the ending, they now feel it make sense with another movie so close to happening.